The Kind of Prosecutorial Misconduct in the Mickey Thompson Murder Case is a National Problem, 149 Exonerations in 2015. Although Los Angeles repeatedly decline to prosecute Goodwin because of “insufficiency of evidence,” the D.A. there was somehow persuaded to file charges against Goodwin before he could be released from the Orange County jail in 2004. Goodwin has always claimed innocence and there has never been any evidence connecting him with the murders in any way. Although the Los Angeles D.A. claimed there was new evidence, the very same evidence that had been used in Orange County was used to re-charge Goodwin. After years of obfuscation by the L.A.D.A., Goodwin now has ample evidence to show his trial was manifestly unfair and that he was wrongfully convicted. There are hundreds of pages, mostly public record, showing prosecutorial, judicial and law enforcement malfeasance and misconduct. Goodwin has presented this evidence to the L.A.D.A., Los Angeles Sheriff’s Department, Orange County District Attorney and other agencies and official involved in his wrongful conviction. The results of a year-long investigation by the L.A. Sheriff’s Department have not been revealed. The evidence of Goodwin’s wrongful conviction has been presented to the L.A.D.A.’s newly formed “Wrongful Conviction Unit,” that has been largely silent. Justice on Trial has been collecting signatures on a petition that demanding that the L.A.D.A. address this obvious wrongful conviction immediately. The prosecutors responsible for the fatally flawed 2006 trial left the D.A.’s office unexpectedly in 2012, soon after the newly elected D.A., who had as a campaign platform plank, cleaning up the D.A.’s office, was sworn in. Both Orange County and Los Angeles have experienced many other prosecutorial misconduct cases and, nationally, on February 12, 2016, the New York Times reported that, citing figures from the National Registry of Exonerations, 149 people have been exonerated in 2015, the highest total since, 1989. Although not all such exonerations are counted, the Times reports 1733 exonerations have occurred since 1989 when the grim annual statistics on wrongful convictions began. The Los Angeles District Attorney needs to address the massive evidence of Goodwin’s wrongful conviction immediately. He has been in jail for 15 years for a crime he claims he did not commit and, despite the 2007 conviction, there is no evidence that he was involved in any way with the murders. The Netfilx hit true-crime series “Making a Murderer” leaves many people wondering: Just how common is the story of a wrongful conviction in America’s criminal justice system? Too common, according to a new report that tracks exonerations. Michael Goodwin, who claims innocence, has been jailed since 2001, convicted in 2007 for the 1988 murders of Mickey and Trudy Thompson. Goodwin, the creator of the sport of Supercross, and Thompson, a 60’s racing legend, unsuccessfully attempted to merge their stadium racing companies. Thompson sued and won a judgement against Goodwin which prosecutors claim gave him the motive to have Thompson murdered. However, Goodwin had irrevocably placed sufficient funds with a bankruptcy trustee prior to the murders to pay all Chapter 11 bankruptcy creditors, including Thompson. The investigation, taken up by a homicide detective nearly 10 years after the murders, was fatally flawed with false evidence, some generated by a $1 million reward offered by Thompson’s sister. Key evidence has been shown to have been falsified by the detective and was dropped from the Orange County case, leading to a dismissal, in 2004. Although Goodwin was recharged in Los Angeles following the dismissal in Orange County, no evidence of any kind has ever linked Goodwin to the murders or killers who have never been identified. Nevertheless, prosecutors alleged Goodwin conspired with the unnamed killers to have the Thompsons murdered. They used and amplified false evidence of prior crimes that never occurred to convince the jury of Goodwin’s “…lack of moral compass…,” wrongly convicting him. This organization has worked with Michael Goodwin, his attorneys and supporters since Justice on Trial’s founding in 2002. 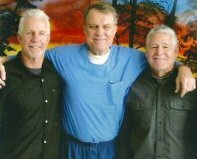 It is our firm belief, based on a massive assemblage of unequivocal evidence, that Mr. Goodwin was wrongfully convicted by two august prosecutors, both of whom unexpectedly left the D.A.’s office in 2012. The appellate court and the California Supreme Court rubber-stamped the conviction, despite compelling evidence in Goodwin’s appeal of an utterly corrupted trial. Mickey Thompson, a ‘60’s racing legend, and his wife were brutally gunned down in 1988. The killers have never been identified, yet in 2007, Michael Goodwin, the creator of the sport of Supercross, was convicted of conspiring with the unknown murderers to “orchestrate” the Thompson murders. There has never been one iota of evidence connecting Goodwin with the killings or killers yet prosecutors convinced the jury, using a contrived, fallacious financial motive, that Goodwin ordered the murders. He is serving two life sentences without parole. Eight years of aggressive obfuscation by the L.A. District Attorney, Superior Court and others led to the denial of Goodwin’s appeal and his petition for review by the California Supreme Court. TAINTED INVESTIGATION/INVESTIGATOR: The lead investigator, who inexplicably took the case nearly 10 years after the crimes occurred, committed egregious misconduct throughout his investigation, pre-trial hearings and trial. This Los Angeles Sheriff’s Department detective’s lead evidence was exposed by Goodwin to be patently false and was subsequently dropped by the District Attorney in Orange County. Goodwin had been initially charged there, out of jurisdiction, but the case was dismissed in 2004 with a stinging rebuke of the O.C.D.A. for ever having charged Goodwin. LEAD INVESTIGATOR INVESTIGATED BY SHERIFF’S DEPARTMENT: The L.A.D.A. and L.A.S.D. have been provided with documentation of blatant falsification, destruction, withholding of, forging of, and other tampering with, critical evidence by law enforcement and prosecutors. The lead investigator from about 1997, Det. Mark Lillienfeld, has been under investigation by the L.A. Sheriff’s Department since 2014. Indisputable confirmation of these activities has been presented to the Professional Standards Division of the L.A.S.D, with the only response being that “Administrative Action” had been taken. Inquiries by Justice on Trial as to the final disposition this L.A.S.D. investigation have gone unanswered. EXTENSIVE PROSECUTORIAL MISCONDUCT by the two Thompson murder trial prosecutors, Patrick Dixon, former Assistant to the District Attorney, 2nd in command at the L.A.D.A.’s office at the time of the trial, and Alan Jackson who, based in some measure on Goodwin’s trial, was named “2010 Los Angeles’s Prosecutor of the Year” and, in the 2012 election, Jackson lost a bid for the top spot in the L.A.D.A.’s office. Dixon and Jackson presented, and expanded upon, strictly prohibited and demonstrably false evidence to the court in order to disparage Goodwin’s character. They told the jury about crimes that Goodwin had been falsely charged with in 1993 as proof of his “low moral character.” In a sworn declaration, the jury foreman, after the trial, stated that the prosecutors’ presentation of this false and misleading information about other crimes supposedly committed by Goodwin led them to believe Goodwin “…had no moral compass…” and was therefore capable of conspiring with unknown killer or killers to orchestrate the Thompson murders. Prosecutors also failed to deliver to the defense, as required by law, hundreds of documents and other materials that were highly exculpatory evidence, known to be in their possession. WIDE-RANGING PERJURY throughout the Orange County and L.A. Preliminary Hearings and the L.A. trial, by law enforcement, prosecutors, expert and other witnesses. Some trial testimony, including from expert witnesses and law enforcement, is so brazenly contradictory, that a reading of the trial transcript leaves legal professionals who read it, shaking their heads. EXTREME JUDICIAL BIAS AND MISCONDUCT. The trial judge’s bias was so pronounced that mention of amazingly prejudicial rulings was made in the Orange County Register. The judge had worked in the D.A.’s office, under the lead prosecutor, prior to her becoming a Superior Court Judge. Her instructions to the jury were not only highly unusual but, in some instances, illegal. $1 MILLION REWARD’S INFLUENCE ON INVESTIGATION AND TRIAL: A major influence on the investigation and trial is the phony $1 million reward, an expansion of a real, far smaller, reward that was offered shortly after the murders. There was a dramatic difference in testimony by crime scene and many other witnesses who made statements at the time of the murders that significantly contradicted statements and testimony given after the posting of the sham $1 million reward. The reward was posted with widespread, even national, multi-media exposure by politically powerful Thompson’s sister, Colleen Campbell. Michael Goodwin was erroneously featured as a prime suspect despite the reality that authorities had no evidence, whatsoever, linking him to the crimes in any way. As a result of Detective Lillienfeld’s extensive evidence tampering, creating a fictional, theatrical scenario of how the murders occurred and who the killers were, Campbell and Lillienfeld knew the reward would never have to be paid. Following Goodwin’s conviction, after 18 years and with the killer/killers never having been identified or aggressively pursued, Campbell raised a checkered flag in front of national TV cameras and confirmed the veracity of the claim that the reward was a brilliant ploy to influence the investigation and trial by saying, “One down, two to go!” This was a clear indication that the reward would not be paid. There has been no public indication that any portion of this sham reward has ever been paid to anyone. The results of our research on the Mickey Thompson murder investigation, prosecutions and trial is exemplative of the prosecutorial excesses and corruption in Southern California and throughout the U.S. Research into such cases by other advocacy organizations like The Innocence Project has led to record numbers of wrongful convictions being reversed, 150 last year, and 175 to date this year to date. The L.A.D.A. needs to closely examine the allegations that Goodwin has made about his politically motivated, wrongful conviction, now. That an investigation, prosecution and trial can be so corrupted by outside interests, so completely ignore the rule of law and unjustly convict a person, is unconscionable but indicative of the condition of California’s and America’s justice systems. This current D.A., Jackie Lacey, campaigned on cleaning up the D.A.’s office. Shortly after her election win, both of these high-ranking prosecutors, Patrick Dixon and Alan Jackson, left the D.A.’s office unexpectedly, after 38 and 18 years of service, respectively. That is a great start but exposing and correcting what they have done is crucial. This grave miscarriage of justice took place on D.A. Lacey’s predecessor’s watch so adjudicating this wrongful conviction now and meting out real justice to Michael Goodwin and others wrongfully convicted is a win/win, correcting a serious injustice and fulfilling her campaign promise. The 4 percent figure is a conservative estimate, the researchers say in a study published Monday. Some of the innocent on death row are exonerated and freed, but not all, the study says. At least four percent of death sentences in the US send an innocent person to death row, according to new research published Monday in the scientific journal Proceedings of the National Academy of Sciences. Some of those people are exonerated and freed – but not all of them, the researchers report. The study follows a broader report earlier this year that found that a record number of people were exonerated for crimes in 2013, suggesting that innocent people go to prison far more often than had been thought. The study authors found that over a 31-year period, 1.6 percent of inmates sentenced to death were exonerated and freed. Of the remaining innocent inmates, some see their sentences reduced to life in prison, while others are executed, the authors say. But for those wrongly convicted inmates who are removed from death row and not exonerated, their new life sentence among the general prison population is a mixed blessing: the odds of being executed are now nil, but their chances of being freed also plummet, since, once off death row, outside efforts to prove their innocence tend to slow, or even cease, according to the researchers. The new research is based on US death row records kept between 1973 and 2004, during which period 7,482 defendants were sentenced to death. As of Dec. 31, 2004, 1.6 percent of them, or 117 people, had been exonerated, some 12 percent had been executed, and about 46 percent were still on death row. To estimate the percentage of death-sentenced defendants who were wrongly convicted, the researchers applied what is called survival analysis, a statistical technique often used in studies of medical treatments. The figure produced by the analysis assumed that all those sentenced to death remained indefinitely on death row, where their cases naturally, and consistently, receive the most scrutiny. In reality, however, that is not the case. “Most death-sentenced defendants are removed from death row and resentenced to life imprisonment, after which the likelihood of exoneration drops sharply,” the authors found. The 4.1 percent figure, therefore, “is a conservative estimate of the proportion of false conviction among death sentences in the United States,” they concluded. Though death sentences represent a minuscule fraction of sentences in the US, exonerations from death row account for a disproportionately large volume of all exonerations in the US, according to the paper. That’s not necessarily because the criminal justice system gets it wrong more often in capital punishment cases, the authors argue. More likely, it’s because no one wants to execute an innocent person, and personnel throughout the criminal justice system put considerable resources into eventually getting it right in those cases, the authors say. But, once a person is taken off death row, defense attorneys, prosecutors, and innocence projects feel far less urgency to find and correct wrongful convictions, the authors write. Though the researchers report that the number of innocent people put to death in the US is likely small, given the energy the system expends to avoid executing the wrongfully convicted, it is not zero, they say. Those people likely include Todd Cameron Willingham, the Corsicana, Texas, man executed in 2004 for murdering his three small children but who is now widely believed to have been innocent. “If you don’t want to execute innocent people, you don’t execute people,” says Samuel Gross, the lead author on the paper and a professor at The University of Michigan Law School. The reasons that innocent people go to prison are as varied as the crimes of which they’re convicted, and advocates have proposed numerous reforms for limiting the likelihood of convicting the wrong person. Those reforms include overhauling eyewitness identification protocols, mandating that police videotape interrogations, upping the stakes for prosecutors who behave unethically, and improving the public defender system. Still, “the next best thing” to preventing wrongful convictions from happening in the first place is to improve how innocence claims are handled post-conviction, especially when dealing with life sentences, says Mr. Gross. Before a final settlement could be signed, Thompson was brutally murdered by assailants who have never been identified. Goodwin was immediately suspected but after nearly nine months of investigation, authorities could develop no evidence tying him to the murders. Detectives did, however, develop other suspects, one of whom confessed, failed a polygraph, was identified as looking like a white man that was seen at or near the murder scene. However, 18 years later, at Goodwin’s trial, the judge would not allow Goodwin’s defense to present this, and additional evidence of other suspects, to the jury. Despite the conviction, the prosecutors have never tied Goodwin to the murders. The jury foreman, having seen that there was evidence of other suspects, stated that the verdict would have been different had the jury seen this evidence. Goodwin has been in jail since his arrest in December of 2001, even though the case was dismissed in Orange County in 2004. The Los Angeles District Attorney filed charges just hours before Goodwin could be released from the Orange County jail. From a cell at R.J. Donovan State Prison, Goodwin detailed his efforts to clear his name. His appeal has been filed, responded to by the California Attorney General with a final reply by Goodwin on January 9th, 2014. Goodwin has also filed a complaint against the judge who presided at his trial, Judge Terri Schwartz, for extreme bias. Published: Sept. 30, 2013 Updated: Oct. 1, 2013 11:03 a.m.
I’m reading “Bleak House” by Charles Dickens, whose cynical message about his era’s dysfunctional judicial system is characterized by a lawsuit that carries on for generations, doing nothing more than employing barristers, churning out reams of paperwork and keeping the lives of numerous innocent parties in limbo. So on Monday, when I hefted the attorney general’s 291-page response to the defendant’s 472-page appeal in the People of the State of California v. Michael Frank Goodwin, I imagined I was in 19th-century England reading pleadings from Dickens’ iconic Jarndyce v. Jarndyce. Mike Goodwin, center, with two long-time friends, Tom White, left and Bryon Farnsworth, right, in a 2011 photo. As a practical matter, People v. Goodwin is 25 years old this year, having its genesis in the 1988 slayings of race car driver Mickey Thompson and his wife, Trudy. They were gunned down in their driveway in Los Angeles County by two men who have never been identified. Goodwin, an O.C. resident and Mickey’s former business partner, was immediately suspected of hiring the killers, but it wasn’t until 2001 that he was charged. Goodwin was convicted of murder in 2008 and got a life sentence. His appeal was not filed until last year. The delay is due to a variety of Dickensian reasons I don’t have room to detail. So when I last wrote about the case, in December, I focused on just four of the defense’s 27 grounds for appeal. Today, we’ll look at the A.G.’s responses to the two that have O.C. roots; Wednesday, we’ll look at two grounded in L.A. County law enforcement activities. Issue One: Undue Influence? Goodwin’s appellate lawyer, Gail Harper, alleges that the L.A. D.A.’s office did not file charges for 16 years because it had no case. She contends that Mickey’s sister, former San Juan Capistrano Mayor Collene Campbell, improperly influenced a new L.A. Sheriff’s detective, Mark Lillienfeld, to seek prosecution in O.C. Campbell’s influence, Harper claims, extended to O.C. District Attorney Tony Rackauckas,with whom Campbell had worked on victims-rights issues. It was T-Rack who first charged Goodwin, in 2001. An appellate court said O.C. didn’t have jurisdiction and threw out the charges. Then, L.A. County’s new D.A., Steve Cooley, decided to pick them up and file in his county’s court. Harper contends that but for the improper influence of Campbell in O.C., Goodwin would never have been charged and convicted in L.A.
A.G.’s Response. As to the detective, the A.G. says, once a crime occurred in a jurisdiction covered by his agency, he was authorized to pursue the case anywhere in the state. Regarding Rackauckas, the A.G. says Harper’s allegations of an improper relationship or undue influence between Campbell and the D.A. were not supported by anything Harper submitted to the appellate court. Moreover, the A.G. indicated, even if the allegations were true, Goodwin wasn’t harmed by any undue influence on Rackauckas because he ultimately was not tried in O.C. Issue Two: Illegal Raid? Harper also has challenged the search of Goodwin’s O.C. home office and the seizure of documents containing communications between Goodwin and his lawyers. Goodwin had put a sign on the door saying that privileged materials were inside, but the documents were seized anyway and ultimately read by Alan Jackson, one of the L.A. prosecutors. Jackson should have been removed from the case, Harper says, and the fact that the trial judge failed to do so is a reversible error. A.G.’s Response. The A.G. attacks this contention on several fronts. For one thing, the A.G. says, Harper doesn’t identify any particular document that the defense believes resulted in prejudicing the case against Goodwin. She didn’t cite information the prosecutors used that aided them or hurt the defense. Also, even if the documents were improperly seized, it wasn’t the L.A. D.A.’s office that was responsible for it but rather the O.C. D.A.’s office, which was working the case at the time and had rebuffed Goodwin’s attempt to protect the materials, and the L.A. County Sheriff’s Department, which carried out the search. “For purposes of establishing outrageous governmental misconduct, there is no authority for attributing misconduct by law enforcement officers to unwitting prosecutors,” the A.G. wrote. Published: Oct. 1, 2013 Updated: 7:11 p.m. Yesterday: Responding to Michael Goodwin’s appeal of his conviction in the 1988 murders of legendary racer Mickey Thompson and his wife, Trudy, the state attorney general rebuts two of the Orange County-based grounds for appeal. Goodwin’s attorney, Gail Harper, raised 27 grounds for appeal in her 472-page opening brief. I’m focusing on the four I find most interesting, although it’s impossible to know which, if any, the Court of Appeal will find persuasive. Today, we look at the two that were based on activities of the L.A.-based part of the investigation and trial. Issue One: Late-arriving witnesses. Harper challenged the sufficiency of the only evidence that put Goodwin near the murder scene in Bradbury. A husband and wife testified that a few days before the murders they saw Goodwin sitting in a station wagon with binoculars along with another man who was never identified. This, in my opinion, was some of the most important evidence of the 2007 trial. The defense challenged the credibility of Ron and Tonyia Stevens because they didn’t make the identification of Goodwin until 13 years after the murders, when they were finally interviewed by a detective. That gap, along with several TV shows that featured Goodwin as a suspect, “destroyed any possible true memory of the men in the station wagon,” Harper wrote. A.G.’s response: The A.G. defense to this largely rests on the principle that appellate courts generally look for legal errors by the trial judge. They usually don’t second-guess how juries weighed the credibility of witnesses. For an appellate court to override the jury’s belief in a witness, the court must find the statement was a physical impossibility or the falsity must be apparent. That’s not the case with the Stevens’ testimony, the A.G. says, and points out that Harper didn’t attack the testimony on those grounds. Rather, Harper attacked the statements for being inconsistent between preliminary hearing and trial. There were inconsistencies, but the jury had a chance to sort that out through extensive cross-examination. It’s not the appellate court’s job to override the jury in that case, the A.G. says. Issue Two: Mystery Suspects. Harper says that at trial Goodwin was wrongly deprived of the right to argue that men unrelated to Goodwin killed the Thompsons. The defense theory was that a man named Larry Cowell wanted Mickey killed to prevent him from testifying against him in a murder trial. Cowell had supposedly hired a man named Kennedy who in turn supposedly hired three men – two shooters and one lookout. Detectives had looked at a suspect named Joey Hunter, the purported lookout man, who had been seen on a bicycle several miles from the Thompson home within hours of the murders. He had failed a polygraph, given a false alibi and purportedly confessed to an acquaintance. The trial judge, Teri Schwartz, had forbidden Goodwin’s trial attorney, Elena Saris, from telling the jury about the whole Cowell-Hunter theory. A.G.’s Response: A judge can allow third-party culpability evidence only if she finds evidence that links the third person to the crime. Motive or opportunity evidence is not enough. Before deciding to exclude the evidence, the A.G. says, Schwartz heard extensive argument that convinced her there was no link between Cowell, Kennedy, the two purported shooters and the crime. As for Hunter, the A.G. says, he was only picked up because he matched the description of a person “frantically hitchhiking” two miles from the murder scene. Three of five witnesses failed to pick Hunter out of a lineup. The prosecutors presented Schwartz with “a detailed explanation” why the supposed confession was unreliable – although the response doesn’t say what that explanation was. As to the polygraph, that is inadmissible with no exceptions. “In sum, the trial court acted well within its discretion” to bar the third-party culpability evidence because Saris had “raised nothing more than speculative inferences that third parties conspired to kill the Thompsons,” the A.G. says. What’s next? Harper will file a rebuttal, which is at least two months out. My guess is we’re looking, at best, late 2014 for a ruling. THE CSI EFFECT: A relatively new problem with justice in America has recently emerged. Most of what the public knows about the legal system comes from media reporting and the pseudo-documentaries that purport to depict law enforcement realistically. Known collectively as the “CSI Effect,” the phenomenon affects not only trials but also the public’s perception of what happens in criminal investigations. Simply put, “It just ain’t so.” The altruism we see in Cold Case Files; the intense investigation we see on CSI, SVU; the reluctance of prosecutors and judges to pervert the legal system we see in “Law and Order” is “creative license” taken by teleplay writers and it is what should happen, but rarely does. Legal professionals are concerned at the heavy influence of these semi-fictional dramatic presentations on the outcome of trials where “CSI expert” juries base their verdicts on their own “forensic evaluations” of the evidence. In effect, jurors who rely on the “expertise” acquired by viewing TV-crime programs are overruling the expert forensic witnesses. Courts, though they should, rarely instruct juries to disregard their “TV crime busting experience” when reaching a verdict. Below are highlights of some of other, much more serious, flaws in the system that Justice On Trial, using contributions and grants, hopes to offer suggestions, and lobby for legislation, to improve. The courts support prosecution for conviction, not exoneration. Prosecutors are paid to convict, not acquit. Most judges are former prosecutors and are not, as is the common misconception, neutral “referees” leaning in favor of protecting defendants’ rights.Can you imagine a trial where prosecutors actually presented exculpatory evidence, which, by the way, the law prescribes? 2. ARREST WITHOUT EVIDENCE: Officials can and do arrest on no, or flawed, even fabricated, evidence. Affidavits are sworn, under penalty of perjury, so judges, relying upon the honesty of law enforcement and prosecutors, approve such documents without corroboration. Judges are unable to verify evidence in a “sworn officer’s” affidavit. There are evidentiary requirements for arrest, search and seizure and preliminary hearings. However, they are based upon the premise that officers of the law and courts will rise to these standards of law, voluntarily, accurately and truthfully. Some do not. Frequently, in cases where there is little or no evidence, the “instincts and experience” of law enforcement point them to a suspect early in the investigation. To validate these de facto “declarations of guilt,” officers and/or prosecutors “fudge” evidence to arrest and prosecute so conviction becomes, in effect, a self-fulfilling prophecy of guilt. Officials “amplify” weak evidence; falsify forensics that would be difficult for the defense to verify; manipulate witness testimony; avoid investigation of other suspects, and withhold exculpatory evidence to strengthen the case and validate that prophecy of guilt. Once this declaration is made, officials rarely admit malfeasance or incompetence, even if evidence is developed exonerating the defendant. Prosecutors are often reluctant to reverse their convictions even when presented with incontrovertible DNA or other evidence, exonerating a convicted defendant. 3. YEARS OF INCARCERATION WITH NO TRIAL: Routinely, defendants, many who present no danger or the very remote possibility of flight, are held without bail or unaffordable bail, for years. “Speedy trial” is another fallacy of the American Judicial system. The more serious the crime alleged, the longer it will take the defense to prepare for trial. Our current client (see details on Mickey Thompson prosecution in the related posting, “PROPHECY OF GUILT”) has been in jail for 13 years, claims his innocence and has filed a 472 page direct appeal that his appellate attorney stated contained “prosecutorial misconduct, on an unprecedented scale.” It took nearly seven years to go to trial and has taken an additional six years for his direct appeal to be filed, much of the time spent demanding evidence that was withheld by prosecutors at trial. With the assistance of Justice On Trial, a motion to dismiss was filed and the case was dismissed in Orange County, after nearly 2 1/2 years where it was first prosecuted unsuccessfully. The defendant served a total of 30 months without having been convicted or ever having a trial. Unfortunately, this case has still not been resolved fully and is not unique. A. That sufficient evidence does exist, when most often it does not; that he will be charged and almost certainly convicted with a long sentence. B. If he goes to trial it could take years (it will) and, should he lose and appeal, he could spend many years in jail (he would) and still be sentenced at the highest end of the sentencing standard, without “time served” being counted because he was uncooperative by not accepting the plea bargain. Then, for a the hapless defendant’s admission of guilt, regardless of claims of innocence, he will be offered the opportunity to plea to a lesser offence, carrying a lighter sentence, usually with “time served” counted. This is a “Plea Bargain,” not a conviction; defendants waive their right to a trial. Therefore, without a trial, and to avoid extra years in jail, many of whom claim innocence accept such plea-bargains. In fact, many of the serious crimes that are plea-bargained have not really been solved. Countless defendants, later proven innocent, had accepted negotiated convictions. Estimates by legal professionals run to 10% or more wrongfully convicted and advocacy organizations such as Innocence Project have exonerated hundreds. Tragically, when an innocent person accepts a plea-bargain, the criminals who actually committed the crimes are still at large. All prosecutors erroneously claim these plea-bargains as convictions. It is not done to save the courts’ time and money, as officials claim, but to make the job of law enforcement and criminal prosecution easier and to make “conviction” and crime statistics look more positive and impressive. By reducing charges in a plea bargain, the seriousness of the crime committed/solved is officially diminished, often from a felony to a misdemeanor. The original, more serious, crime is “solved” and the case is listed as a prosecution/conviction on the lesser offence. Depending on the spin needed, prosecutors cite increased convictions overall and/or fewer serious crimes prosecuted. the irrelevance of innocence in today’s American system of justice. 5. ESTIMATES OF INNOCENTS IN JAIL RUN TO 200,000 OR MORE: If that were true, what an outrage! But, it is. You may have heard that Barry Scheck, nationally known trial attorney, has headed up a similar non-profit organization, Innocence Project for several years. This group has been responsible for more than 300 cases overturned, some from death row, primarily based on DNA evidence. (Read “Actual Innocence” by Barry Scheck, for more information and some astonishing statistics on numbers of innocent inmates in U.S. jails). The U.S. has the largest inmate population of any country in the world, over 2 million. Because of the overwhelming numbers of wrongfully accused cases pending that involve exculpatory DNA, Barry’s organization and others like it are unable help those wrongfully charged or those crimes that do not involve forensic DNA evidence.Justice On Trial will specialize in this area of injustice. To assist in avoiding conviction of those wrongly charged. To investigate and help overturn cases of the wrongly convicted.